OK. So I'm pretty sick and tired of people telling me I'm wasting my vote by supporting Gary Johnson. I'm really sick and tired of people telling me that a vote for Gary Johnson is a vote for Barack Obama. News Flash! 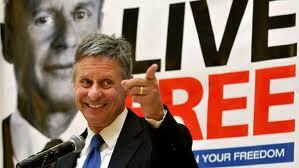 My vote for Gary Johnson is a vote for ...Gary Johnson. Surprise!!! My vote belongs to me until I bestow it on someone. It doesn't belong to Mitt Romney. It never belonged to Mitt Romney. I'm not stealing my own vote from Mitt Romney. I believe Mitt Romney is an honorable man. A little light on convictions maybe, but an honorable man. I'm sure that my views and his might even align on some things...if I just knew what his views really were. I also believe that Barack Obama was then, and remains today, a horrible choice for president. I further believe there is a difference between Mitt Romney and Barack Obama, but not enough of a difference. So I will vote for a candidate who will surely lose this time around. I will NOT vote for the lesser of two evils. If Mitt Romney loses this election, contrary to what a bunch of crybaby Republicans will be saying, it will NOT be my fault. It will be because thousands of voters decided to tell the Republican Party you need to earn our votes. We reject your choice for president. And if you do this to us again in four years, we will reject that choice as well. Good candidates get our support. Mediocre candidates get rejected. You believe in competition and free markets? Well, that's the free market at work. Liberty may be a niche product today, but we've got big marketing plans for the future, and those plans start with taking market share from both of the big government parties a little bit at a time. We're not buying an inferior product just because it's more popular. But wait, there's more. I live in Delaware. We are the Bluest of Blue States. No matter how I vote, Romney or Gary Johnson, Delaware's three electoral votes will go to Barack Obama. That is a sad fact for both Republicans and Libertarians, but it is very liberating. If you are a Libertarian, or an Independent who thinks both major parties have let you down, or even a Republican who thinks their party made a terrible choice for nominee, you can demonstrate your dissatisfaction at absolutely no cost. You too can "waste" your vote on Gary Johnson, and tell the Republicans, "Seriously? That's the best ya got?" Stop thinking about the next four years. Start thinking about the next forty years. Stop thinking about yourself. Start thinking about your children. Oh, don't believe me about Delaware being a Blue State? Here are the stats for the last twenty years. I'll be "wasting" my vote for Gary Johnson this year. You can waste yours on whoever you like. No consequences.